THE TWO JAKES generated a lot of hum & buzz before it wrapped production and hit the screen. 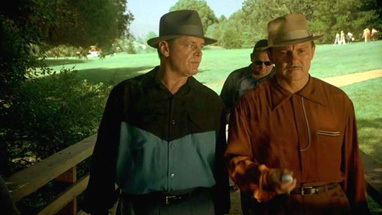 The reputation of Chinatown continued to grow over sixteen years, so fans had their fingers crossed when writer Robert Towne and star Jack Nicholson brought character ‘Jake Gittes’ back to the glories and sins of pre-freeway Los Angeles in this 1990 outing, directed by Nicholson. Overwritten to the point of confusion, listless, with most of the large and impressive cast sounding more like actors reading for the parts than those really inhabiting their characters. The segments of narration drone, the adequate score from Van Dyke Parks suffers in the shadow of Jerry Goldsmith’s work on the earlier film. Draggy 137 minutes is nicely photographed by Vilmos Zsigmond, and director Nicholson does employ a few interesting scene transitions. Liveliest performance comes from Madeleine Stowe. Costing $19,000,000, it flopped, earning only half back, coming in bedraggled at 96th place for the year. On view: Harvey Keitel, Meg Tilly, Eli Wallach, Ruben Blades, Frederick Forrest, David Keith, Richard Farnsworth, Tracey Walter, Joe Mantell, James Hong and Perry Lopez. Tom Waits does an unbilled bit, Faye Dunaway lent a voiceover.